I decided to go to Hiroshima around 20:40 the day before suddenly, and I called "Japan Airlines". As I could not afford to receive an airline ticket, my reservation procedure was finished by e-ticket. But I did not reserve anything except my flight to Hiroshima, and did not have any guidebook and timetable. Thinking Hiroshima Trip after Arrived?!! At Tokyo Haneda airport, I took the first flight to Hiroshima in the morning. After arriving at Hiroshima airport, I rode a bus to JR Hiroshima station (about 50 minutes). 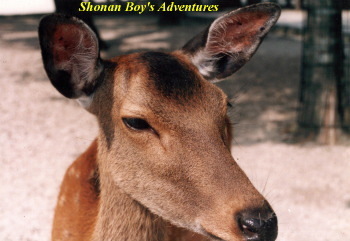 As I did not have a guidebook, I bought it there. Reading it, I checked sightseeing spot by red pen, and I choosed sightseeing bus that I checked most of them. Then I proceed to a travel agency. To take street car "Hiroshima Dentetsu (Hiroden, Hiroshima Railways)" is also convenient for travel in this city. One-day excursion ticket is sold. 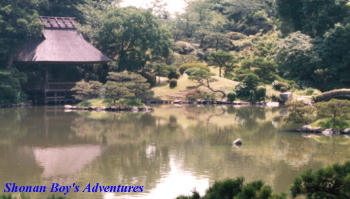 In 1620, Shukkeien was built by Asano, Nagaakira (the then feudal lord in the domain of Hiroshima as his another house. 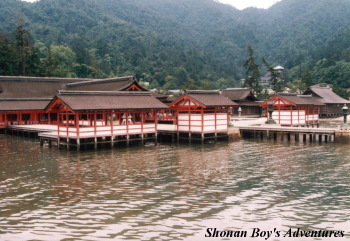 The name of Shukkeien came from "the place where it was provided with many scenic spots. According to another theory, it came from West Lake, Hangzhou, China. In 1945, it was destroyed by A-bomb, and was restored by the Hiroshima board of education. In 1589, it was built by Mori, Terumoto. It is also called "Rijo". Rijo means carp castle. 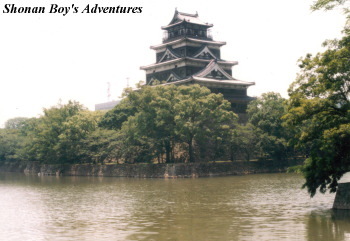 This castle was destroyed by A-bomb in 1945, and was restored in 1958. At present there are rooms stored with reference works of reference material. Unfortunately I could not go there, and saw it from the bus. The Bus Left without Me at Hiroshima Museum?!! Though I was in the Hiroshima Museum and I went back to the place where the bus stopped before departure time, the bus left without me! Because bus guide counted passengers by mistake, she thought all of passgengers boarded. So I could not go to A-bomb Memorial Hall and Peace Memorial Park by bus. I complained about it on the phone to the company. As the next stop of this bus was Miyajima, I wait for it at Hiroshima station. Again I took that bus, and arrived at Miyajimaguchi in 1 hour. Tourists can also go to Miyajimaguchi on the local train of JR San'yo line (about 30 min), and proceed to Miyajimaguchi port on foot (3 min). Some touists go to Hiroden Miyajima station by Hiroshima Railways (street car, about 60min between Hiroshima station and Hiroden Miyajima). After arriving at Hiroden Hiroshima, they can see port in front of this station. Miyajima looks like Shintoism island, and is called Shintoism god's island. That's why there is no grave there. If you have much time, please take a ropeway and see from the mountain with a nice view. "Momiji-manju (it takes the shape of Japanese maple)" is another Miyajima specialty. Passengers can see Itsukushima Shrine before we arrived at Miyajima. In 593, it was built by Saeki, Kuramoto in the era of emperor Suiko. It was registered as a World Heritage on December, 1996. As there are no fense at the stage, some students of school trip felt into the sea from stage. It was because they took their eyes off. While I went back from Miyajima to Miyajimaguchi on ship, an old man told me. And he said he used to make a travel alone in his youth, and he reminded it when he saw me. My sightseeing bus went back to Hiroshima station, and arrived in 1 hour. I thought my trip was one-day. 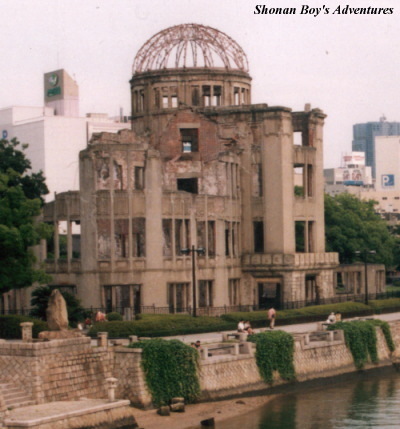 As I could not go to A-bomb Dome and Hiroshima Peace Memorial Museum, I decided to stay in Hiroshima and go there the next day. Though I thought I wanted to change my train ticket, I changed it the next day because ticket office had been already closed. It was difficult to reserve a hotel room. There are no cheap rooms in Hiroshima city. While I had called hotels many times, 2 people asked me they could not call because they did not have just 10 yen coins and owed them. After their calls, my coin was returned. But a girl forgot to do, and went away. So I stayed at the hotel by Hiroshima staion (not cheap). At dinner, I ate "Okonomiyaki" (flat cake of unsweetened batter fried with various ingredients).